The world's leading consumer advice web site for conservatory buyers ConservatoriesOnline.com has announced the winners of its annual Conservatory of the Year Awards, which are designed to highlight the pinnacle of conservatory design and installation, and as such to provide best practice templates for homeowners to follow when choosing an installation for their own home. These Awards were created to highlight just what is possible when installing a modern conservatory and that it can be a stylish, valuable addition to any home, not just modern properties. The best way to show this is by example, and that all that is required is some thought, planning and a conservatory supplier that cares. Those we have selected from 2006 really do represent the state-of-the-art. The 2006 ConservatoriesOnline.com Awards is the fourth to be judged, with selections made from dozens of conservatories featured on the site during the year. Criteria for selecting three category winners and an overall Supreme Winner included internal and external styling, innovation and exceptional quality in manufacture and installation. The Award for the Top Conservatory Installation by a National PVC-U Conservatory Supplier was given to Anglian Home Improvements for an installation added to a stylish contemporary home. Anglian took particular care to match the components and features of the conservatory to those of the host structure, with the dwarf wall a particular success. The finished result is one that is in harmony with the home and its surroundings, a remarkable installation that shows that large companies can still offer great personal service and care. 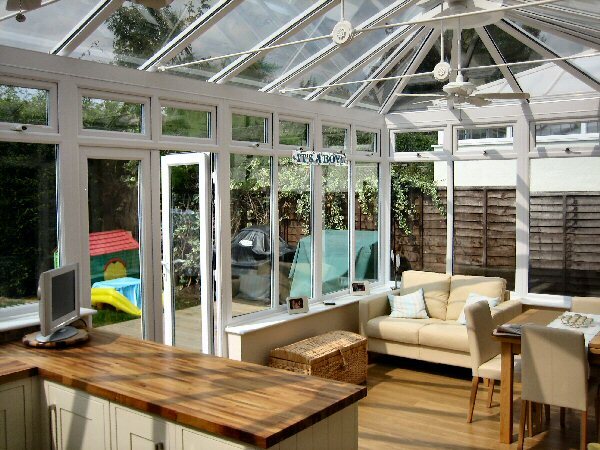 The award for the Top Conservatory Installation by a Local/ Regional PVC-U Conservatory Supplier, has been taken in fine form by English Rose Conservatories a family run business supplying conservatories, doors and replacement windows throughout Essex and the South-east of England. This Double Hipped Edwardian style PVC-U conservatory with rear box gutter is enhanced with the use of a glass roof and internal ceiling fans. It was designed as both an extension to a kitchen and to incorporate a lounge sitting area with the result providing extremely comfortable and versatile accommodation and a perfect addition to the home. 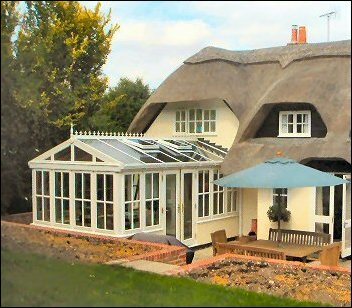 The Best Wood/Hardwood Installation category - and indeed the Overall Winner for 2006 - was won by Richmond Oak Conservatories for a stunning installation gracing a beautiful thatched cottage. This hardwood conservatory is made from naturally seasoned oak and has been designed to blend in with the features of the property with entry via the kitchen. Overlooking mature gardens it is painted in white on the outside to match the Georgian style windows whilst inside the oak is stained to a furniture finish to highlight the rich grain of the timber. Barry Dunlop, founder of ConservatoriesOnline.com, says that the ConservatoriesOnline.com Awards have a very real purpose: "These Awards were created to highlight just what is possible when installing a modern conservatory and that it can be a stylish, valuable addition to any home, not just modern properties. The best way to show this is by example, and that all that is required is some thought, planning and a conservatory supplier that cares. Those we have selected from 2006 really do represent the state-of-the-art." 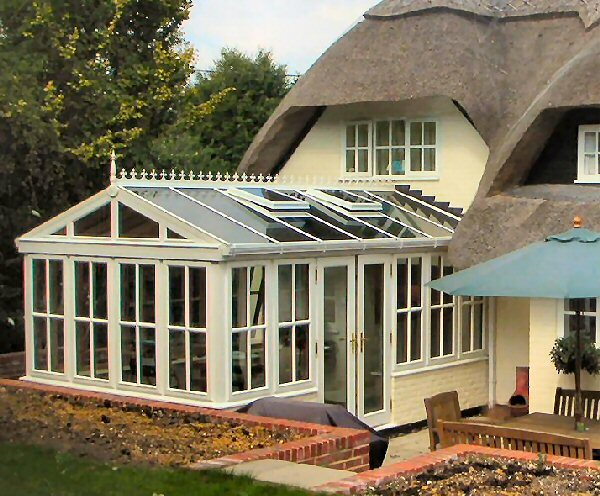 ConservatoriesOnline.com and its related portfolio of web sites is the world's leading source of design and technical advice for millions of homeowners seeking to add a conservatory to their home. It regularly features in the top 10 of the leading search engines and consistently proves itself as the most powerful online provider of referrals and leads for its advertisers and partners, providing them with more than 100,000 leads during 2006 from more than a million users. UPVC ConservatoryUPVC Conservatory, supplied and fitted by English Rose Conservatories PVCU Woodgrain Style ConservatoryPVCU Woodgrain Style Conservatory, supplied and installed by Anglian Home Improvements Oak ConservatoryGracing a beautiful thatched cottage, this hardwood conservatory from Richmond Oak is made from naturally seasoned oak and has been designed to blend in with the features of the property.